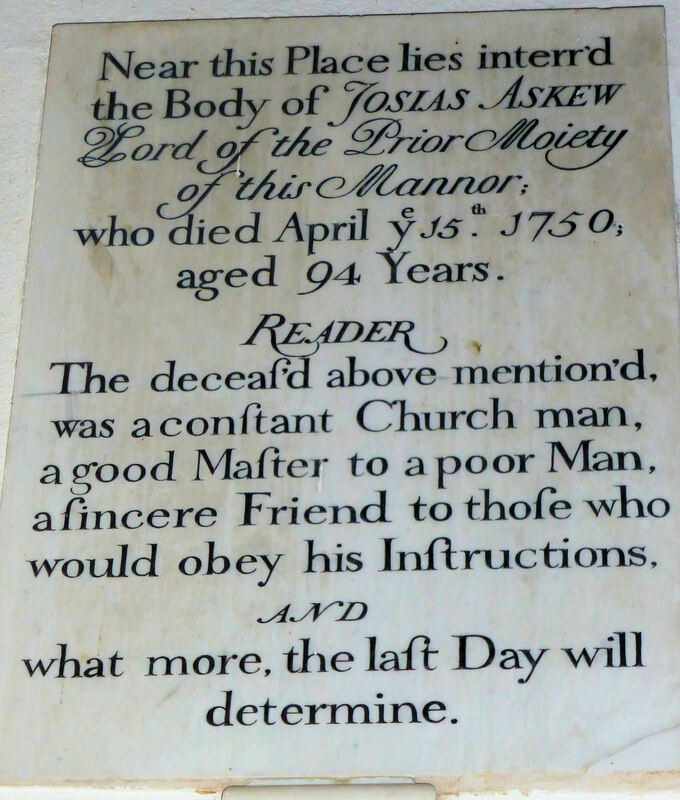 The Askew family are first linked to the Lords of the Manor after the murder of Thomas Adams. The Widow of Thomas, Elizabeth Adams, married Thomas Askew of Swanbourne in 1627, moving in to the Manor House from the Askew Close in Nearton End. He took on the four children Elizabeth had by her first husband. In 1629 Richard Askew was born. He was the first of their four subsequent children. After the murder of Thomas Adams (joint Lord of the Manor) in 1626, his widow Elizabeth married Thomas Askew. Josias appears to be the grandson of Elizabeth and Thomas Askew, inheriting the Manor House and manorial rights. Thomas Adams would have acted as Lord of the Manor for everyday purposes. Judging from the evidence from their Wills (in Bucks County archives), Thomas Adams jnr inherited the Old House from his uncle John Adams who had no male heirs, and his brother Robert inherited the Manor House from Elizabeth. However, Robert had no children, so on his death the Manor House and half moiety of the Lordship of the Manor was inherited by Richard Askew which appears then to pass down to his son or grandson Josias Askew (1656-1750). On his death, Josias leaves the Manor House and lands in his Will to John Deverell. 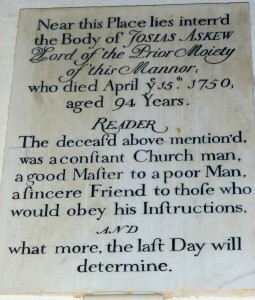 In this way John Deverell of Winslow becomes joint Lord of the Manor in 1750. The Will of Robert Adams shows a closeness when referring to “my brothers Thomas and Josias Askew”. They were his half brothers. Robert Adams referring to his relatives, the Askews. The Askews die out in Swanbourne in the 18th Century, their property being left to the Deverells.